While many people love growing lily of the valley for its attractive, fragrant blooms, some people find lily of the valley invasive, especially when left on its own. This ground cover spreads quickly through rhizomes. For this reason, it normally helps to become familiar with how to eliminate lily of the valley should the situation call for it. For those looking for a good ground cover plant, you can still choose lily of the valley. 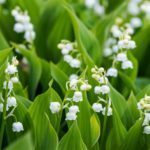 As long as you plant it in a suitable location, one where it has plenty of space to roam without the threat of invading other plants in the garden, lily of the valley can actually be a welcome addition. Likewise, you could try using edging or sink it in containers to keep the plant in bounds. You could also be vigilant about cutting the flowers before they have chance to go to seed. Another way to limit the spread of this plant is by growing it in a sunny area. Since lily of the valley is a shade lover, full sun will slow its growth rate. Should you find lily of the valley is still invasive in the garden, you can always dig it up. In fact, digging up entire plant clumps when the soil is moist and disposing of them elsewhere is one of the surest ways to keep lily of the valley under control, though repeated uprooting may be necessary. So what’s the best way to know how to eliminate lily of the valley permanently? In addition to uprooting the plant, the best way to get rid of lily of the valley is to kill it. There are a couple of ways to do this. The first is by smothering the plant. This is best accomplished in early spring just as the plant is beginning to sprout. If it’s done any later, the larger plants will need to be cut as close to the ground as possible. Place some landscaping cloth, cardboard, a tarp, or several layers of moistened newspapers over top and cover this with anything from mulch to gravel, or whatever will hold it firmly in place. Leave this in place for at least one growing season, at which time the sprouts (and roots) should be dead. The area can then be cleaned up and replanted with something else or left as is. The other method for getting rid of lily of the valley involves the use of a a non-selective type herbicide. Though it can be sprayed whenever needed, to be most effective, you should spray in early spring while the plant is still rather tender and more susceptible to the herbicide. As with digging up plants, repeat applications may be needed to fully eradicate the plant. Read more articles about Lily Of The Valley.